The decision to have mitral stenosis surgery is a tricky one, and it has to be carefully individualized. Not all of these approaches are suitable for everyone who has mitral stenosis. In mitral stenosis, the mitral valve leaflets (flexible flaps that open and close as the heart contracts) become fused together, preventing the valve from opening completely. PMBV attempts to separate the leaflets from one another to relieve the obstruction. In PMBV, a long, thin, flexible tube (catheter) with a deflated balloon attached to it is passed across the mitral valve. The balloon is then expanded. The aim is to break the adhesions that have fused the mitral valve leaftlets to each other. 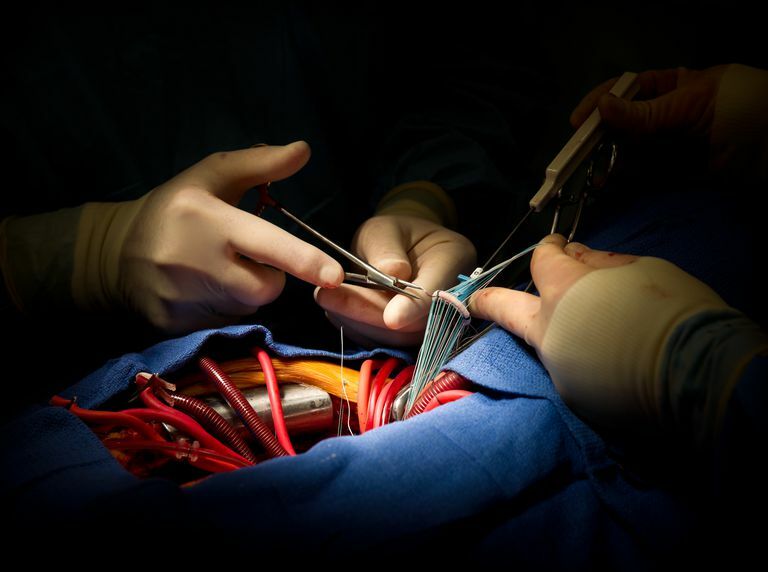 Because PMBV is a catheterization procedure and not open heart surgery, it is much less of an ordeal for patients than the other forms of mitral valve surgery. Complications tend to be relatively minimal, and recovery from the procedure is usually quite easy. PMBV is also very effective when performed on appropriately selected people. In addition, PMBV is usually not an option if your mitral stenosis is accompanied by other complex cardiac conditions. After a PMBV procedure, it is possible for mitral stenosis to begin to gradually worsen once again. For this reason, even after having this procedure, it is important to have periodic cardiac evaluations with echocardiography. Up to 21 percent of patients who have PMBV will eventually need a second treatment. The goal of a mitral commissurotomy is the same as PMBV—to separate the fused leaflets from one another. What's different with mitral commissurotomy, however, is that it is an open-heart procedure that achieves this goal with the use of a sharp surgical blade. Commissurotomy very often gives very good results. Still, you're exposed to the risks of a major surgery and much longer recovery time than with PMBV, which is what stops doctors from recommending it as a first choice. Commissurotomy is often a good option for people who would be candidates for PMBV except for the presence of a left atrial thrombus, valve calcification, or mitral regurgitation. As with the PMBV procedure, mitral stenosis can gradually recur following commissurotomy. People who have this procedure also require continued periodic cardiac evaluations. Mitral valve replacement is the last choice, because it carries a higher risk of complications than either PMBV or commissurotomy. Valve replacement is necessary when the mitral stenosis has caused the mitral valve to become very severely damaged or calcified, making the other two procedures impossible. In mitral valve replacement, the valve is replaced with an artificial (prosthetic) valve. Prosthetic valves can either consist entirely of man-made materials (mechanical valves), or they can be made from the heart valve of an animal, generally a pig (bioprosthetic valve). Deciding which type of artificial valve to use depends on your age and whether you can take the blood thinner Coumadin. All artificial heart valves have an increased propensity to form blood clots. However, blood clotting is less of a problem with bioprosthetic than mechanical valves, so people with the former may not have to take chronic Coumadin therapy; those with mechanical valves do. However, mechanical valves generally seem to last longer than bioprosthetic valves. If you need a mitral valve replacement, are under age 65, and you can take Coumadin, your doctor will likely recommend a mechanical valve. If you are older than 65, or you are younger but can't take Coumadin, a bioprosthetic valve is generally recommended. If you have mitral stenosis, you will need to work closely with your cardiologist to decide whether and when surgery becomes necessary, and then choose the surgical approach that best suits your individual needs. With early diagnosis and conscientious cardiac care, most individuals with mitral stenosis today can expect to live nearly normal lives. Ben Farhat M, Ayari M, Maatouk F, et al. Percutaneous balloon versus surgical closed and open mitral commissurotomy: seven-year follow-up results of a randomized trial. Circulation 1998; 97:245.